This striking portrait, in such fresh condition, demonstrates the qualities that led to Hone's swift rise as a fashionable portraitist in London. Hone had begun his career painting miniatures and enamels, and as a result was not only proficient at detail, but delighted in the bold use of bright colour. In this portrait, painted in 1769 and flamboyantly signed ‘NH’ bottom right, Hone’s stylized, deftly painted eyes are full of movement, while the bright colours of the costume create a powerful image from what is an otherwise unremarkable pose. Nathaniel Hone was born in Ireland, and, it seems, was essentially self-taught. Seeking his fortune, he soon traveled to England to work as an itinerant painter. In the 1740s, after a wealthy marriage, he was able to settle in London, and there formed a large and prestigious clientele. Patrons included the Earl of Bute, Edmund Burke, and Frederick, Prince of Wales. 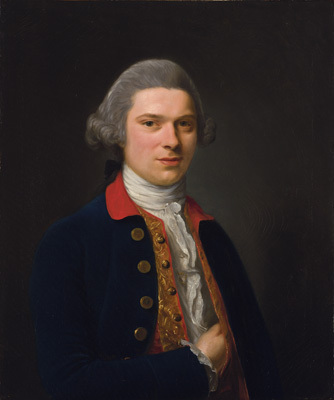 In 1768 Hone was one of a number of artists who left the Society of Artists of Great Britain to found the new Royal Academy, of which he was one of two Irish founding members. But Hone, who seems by nature to have been something of a rebel, soon fell out with his fellow academicians, in particular the President, Sir Joshua Reynolds. Hone’s large 1775 subject-picture, ‘The Conjuror’, was a direct attack on Reynolds’ reliance, as Hone saw it, on Italian compositions by the Old Masters. What Reynolds saw as a revival of the Grand Manner, Hone saw simply as plagiarism. Hone’s picture was rejected, not least because it also alluded to Reynolds’ alleged relationship with Angelica Kauffman, and he ceased exhibiting at the RA. Thereafter, Hone became the pioneer of the one man show, and began exhibiting his own works at independent shows in London, often to great acclaim.